Good news. At the April committee meeting, we unanimously agreed to rename our short story competition the 'Rose Frankcombe Short Story Competition Rose Award (see details below). During May a committee of FAWNW members will determine if sufficient submissions exist to justify production of the anthology. For more information, contact Allan Jamieson. We will hold the next general meeting on Monday, 6th May in the Launceston Library, Level 2, Room 1 starting at 10.00am. The homework is 'Mothers'. NEW! NEW! NEW! NEW! NEW! NEW! NEW! NEW! Plus Highly Commended and Commended Certificates. This competition is open to all short story writers. This competition is for original, previously unpublished short stories written in English. Entry fee: $10.00 for up to two entries. Word Count: between 1200 - 1500 words. Type on A4 paper with 1.5 spacing, using 12pt Arial or Times Fonts. Indent paragraphs, except for the first paragraph. Do not double space between paragraphs. On a separate sheet including the title of the story, word count, and your contact details, (name, address, email, and telephone number.) Send as a Word document, not as a PDF. Do not put your personal details on the story only the title. In the subject line of the email, please put SWWT short story competition. Bank Account Name: Society of Women Writers, Tasmania, Inc. Please ensure that your name and the words SWWT short story or SWWT S/S appear in the deposit line. The next meeting of the Society of Women Writers, Tasmania, will be held on Monday, May 6, 2019, Launceston Library, Level 2, Room 1, 10.00 a.m. to 12.30 p.m.
Our homework for the next meeting is ‘Mothers’. If you cannot attend, you can still email a story or poem on the theme to me, and it will be read out during the meeting. Gold coin donation, raffle, tea and coffee. All welcome. Highly Commended certificates were awarded to the following poets"
Details regarding our 2019 Robyn Mathison Poetry Prize will be on the website later in the year. Warm congratulations to Sally Odgers, recipient of the perpetual Alice Award trophy, 2018, presented by the Society of Women Writers, Victoria. The Society is very pleased to announce Mary Farr has been elected SWWT President for 2018-2019. Mary had previously been our conscientious secretary, a demanding role but one that was approached by her with thought and diligence. Thank you on both counts, Mary. It is with sincere thanks we acknowledge the tremendous generosity of Wendy Laing. Wendy has met much of life's adversity with a disarming smile and incredible stoicism. In 2017 she, for the second time, took on the role of SWWT President. In her cool manner, she has kept the meetings focussed and intrigued by the various exercises and writing information she brought along to share each month. Having previously served as Minutes Secretary, Wendy has now accepted the position of Secretary - and continues as editor of Stylus. Thank you for your dedication, Wendy. Congratulations also go to the hard-working SWWT Executive and committee for their generosity of spirit as they step forward in the various roles required to make a Society run efficiently: President Mary Farr; Vice President Robyn Mathison; Treasurer Anne Wilde (with assistance from Ros Sydes); Secretary Wendy Laing; Membership Officer Ros Sydes; Website and Facebook administrator Rose Frankcombe; Committee Members Yvonne Gluyas, Eileen Litherland; Magazine Editors - Coffee Break, Robyn Mathison, eWings, Anne Wilde. 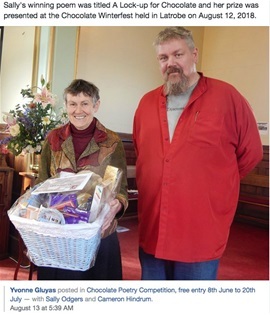 Sally Odgers won the Chocolate Poetry Competition at the Chocolate Winterfest in Latrobe on Sunday, 12th August. Congratulations, Sally. It’s membership renewal time again! Thank you for your support during the last year! NOW is the time to renew your membership for 2018-19, starting July 1st. Please note that those who paid at the June meeting do not need to pay again. IMPORTANT: Mark your deposit as either MEMBER RENEWAL - or for new membership application payments, NEW MEMBER. Scroll down to see the list of winning entrants in the 2017 Margot Manchester Memorial Short Story Award and the Robyn Mathison Annual Poetry Prize. The Society of Women Writers, Tasmania Inc. congratulates all entrants who participated in the 2017 Margot Manchester Memorial Short Story Award and the Robyn Mathison Annual Poetry Prize. I've only just now discovered your short story competition and saw that entries closed yesterday! I have the perfect story to enter. Is it really too late? It is too late for our competition so here is a good site to find competitions that are still open. Is the RM poetry comp only for women? If so, I have a problem. No problem, Allan, both the poetry and the s/s comps are open to all. We look forward to receiving your entry. Thank you for the enquiry.